Using the the Personal Lighting floater to adjust the environment around you in your own view only. This section, Using the Fixed Environment controls and options to control individual Sky and / or Water settings. Importing Windlight Settings and EEP LSL Resources. Sky setting in which the clouds may move, but the time of day doesn’t change by default. Created from scratch (see below). Created from existing assets (e.g. using those from the Library). Imported from Windlight settings on your computer. Fixed Environment assets include elements such as custom Sun, Moon and cloud textures. Fixed Environment settings are the building blocks for Day Cycles. New EEP settings assets can be created either from the My Environments floater or from inventory. Each offers two means to create a new asset. By clicking on the + button at the foot of the panel and then selecting the required asset type (Sky, Water, Day Cycle) – when using inventory, you’ll need to go via the create menu > New Settings sub-menu. Using this method will automatically place the created asset within your Settings folder. 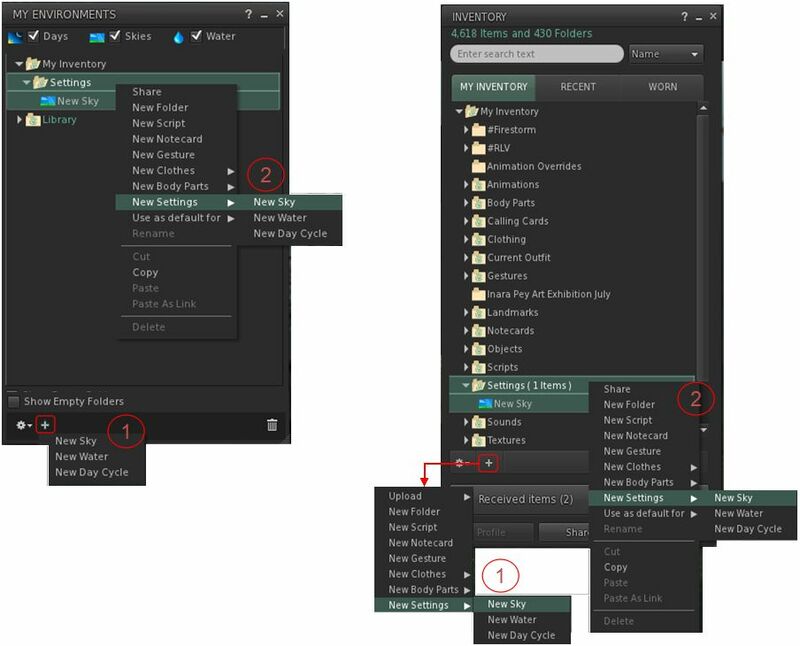 By right-clicking on the Settings folder and selecting the required Asset type via the create menu. You can create new settings in any folder of your choosing in Inventory (or visible in the My Environments panel), but the Settings folder is the recommended location for EEP settings. You can obviously create sub-menus in Settings to organise your EEP assets if you want. Open your inventory or the My Environments floater. Double-click on the required settings asset. Right-click on the required settings object and select Open. Click the gear icon and click on Edit (My Environments floater only). As this section of the tutorial is about Fixed environments, the Sky and Water floaters are described here. Set the ambient light colours (sky, horizon, haze), and select the levels of density, etc. Set the cloud requirements – density, colour, cover, speed of movement – even apply your own cloud texture. Set the Sun / Moon position(s), size, light colour (Sun), brightness, and apply your own custom textures to either. Note that making any changes in this floater will immediately affect the environment in your viewer only and only while the floater is open. You must save changes in order for them to be retained after editing, and you must also apply them (to yourself or to your region / estate or parcel) for them to persist after closing the floater. The floater comprises a number of sections, as described below. Name field: displays the name of the asset you are currently editing. You can manually edit this field to change the name of the asset, if required – just remember to use the Save / Apply button at the bottom of the floater (described later in this section) when saving your updates. Import: allows you to import windlight settings from your computer and have them converted to EEP assets – see Importing Windlight Settings as EEP Assets, later in this tutorial for more on importing windlight settings. Below the top bar are three tabbed sections, which are described below, and the Save / Apply and Cancel buttons, which due to the nature of the Save / Apply button are described for both panels in Save / Apply and Cancel Buttons. Ambient Colour picker: set the ambient sky colour – simply click on the required picker, select the required colour and use the slider for setting the colour density. Horizon and Density colour pickers – simply click on the required picker, select the required colour and use the slider for setting the colour density. Haze sliders: use to adjust the atmosphere and horizon haze. If you’ve not used them before, the simplest way to understand them is to experiment with them. Scene Gamma: set the overall brightness. Moisture, droplet and ice sliders: these change the atmospheric refraction, and can be used with rainbow effects. Important: when editing a Sky settings asset, remember to use the Save options of the Save / Apply button (described below) to save changes you make. Cloud colour picker and sliders: sets the colour of the clouds. 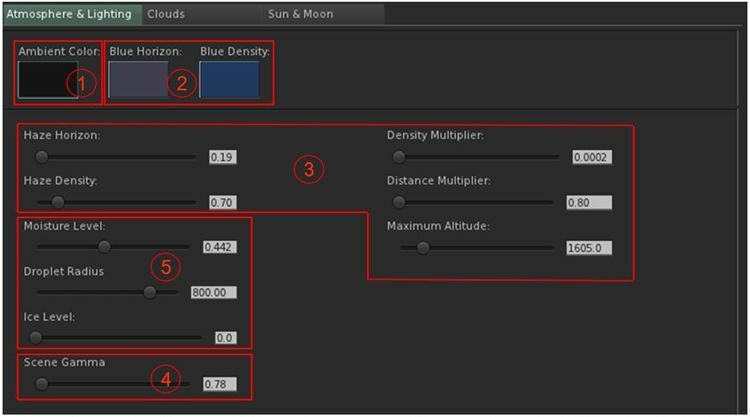 Use the sliders to set overall cloud cover, scale (relative height over the horizon), density and detail across the x, y, axis, together with density. Cloud variance: this adds an amount of randomness applied to the cloud layer. If you have a very regular cloud texture and don’t want the sky to look tiled you can adjust this value to make it less regular. Cloud Scroll: spinners and directional pad for setting cloud speed and direction. Use the spinners for X and Y directions or drag the indicator arrow (for direction) on the pad. Cloud speed is set by the length of the arrow. Cloud Image: allows you to apply a cloud texture for the sky. The Local Texture option can be used from the texture picker to text cloud textures prior to uploading. If a Local Texture is being used, the editor will prevent the asset being saved, helping to remind you to upload it or make sure you’re using a valid texture from inventory. Position trackballs: use the Sun / Moon image on the trackball to adjust the position of the Sun and / or Moon. If the sun/moon image on a trackball is dimmed it is below the horizon in-world, use CTRL-left-click and drag to raise it above the horizon (or conversely, to move it below or onto the horizon. Image pickers: allows you to apply a texture for the Sun and / or Moon. Textures must be uploaded to be applied properly, however you can use the Local Textures option for previewing them before uploading them. Scale: set the relative size of the Sun and / or Moon texture. Colour (Sun and Stars only): apply a colour to the “sunlight”. To hide them in low daylight settings, set to 0. If those who have Advanced lighting Model enabled in the viewer will be able to see stars “twinkle” if they are set bright enough. Moon Brightness (Moon only): set the brightness of the texture used for the Moon. Show beacon: display a local beacon (your view only, and also accessible via the beacons option World > Show > Beacons Ctrl-Alt-Shift-N). The Fixed Environment Floater – Water panel offers a means to edit water asset settings and apply them to yourself (e.g. for testing) or to the parcel / region you are on (subject to permissions). It comprises several elements, as described below. Reminder: EEP water assets only work with Linden water. They are not applicable to prim or mesh water objects. The Name field, Load and Import buttons. These all function in the same way as described for the Fixed Environment – Sky panel. See Importing Windlight Settings as EEP Assets, later in this tutorial for details on importing windlight settings. The Save / Apply and Cancel buttons: again, these function the same way as for the Fixed Environment – Sky panel. Water Fog: a colour picker to set the colour of water “fogging” (or “haze”) when underwater, and sliders to set the density and Fresnel reflectance. The best way to understand the sliders is to experiment with them with your camera under water. A normal map picker: allows you to select a suitable normal map on your computer that you wish to use to define your waves. Normal maps need to be seamless in order to avoid odd tilting effects on water. Note that some creators offer suitable maps via the Marketplace – see Cory Edo’s Water Maps (offer free), for example. Wave scroll pads: spinners and directional pad for setting wave speed and direction (major and minor waves). Use the spinners for X and Y directions or drag the indicator arrow (for direction) on the pad. Cloud speed is set by the length of the arrow. Note the panel also includes a selection of sliders for surface wave scaling (X, Y, and Z) and reflection and blurring. Again, the best way to familiarise yourself with these is to experiment with them. Important: when editing a Water settings asset, remember to use the Save options of the Save / Apply button (described below) to save changes you make. Located at the bottom of the Fixed Environment floater are two buttons: a multi-function Save / Apply button, and a Cancel buttons. Save: save your edits to the current EEP asset (as per the Name field at the top of the panel). Save As: save your edits to a new EEP asset – a dialogue box will be displayed, prompting for the new asset name. This will also update the Fixed Sky panel to be editing the new asset. Apply Only To Myself: as the name implies, applies the settings directly to your viewer – useful when testing how an EEP asset works. Apply To Parcel / Region: these two options will only be available if you are ownership rights to the parcel / region. Important: the Save / Apply options are mutually exclusive – using either of the Save options will not apply an updated setting, and use of the available Apply options will not also save any changes made to the asset settings. You must use both a Save and an Apply option if you wish to save changes and then apply them or vice versa). If you have not made any changes to the asset settings, the panel will close. If you have made any changes to any of the settings in the Fixed Sky panel, a warning will be displayed asking you to confirm you wish to discard (and lose) them. Note that this warming will also be displayed if you attempt to close the panel via the top right X (close) button after editing the settings without saving them. A response of Yes will discard the changes will close the panel, losing your changes. A response of No will close the warning dialogue and return you to the panel, allowing you to use the Save or Save As options to save your changes. If you wish to import Windlight settings as EEP assets, or want to find out about EEP LSL resources, please go to Importing Windlights and LSL Resources.